SouthWest Unitarian Universalist Church (SWUU) is located at 6320 Royalton Road (Rt. 82) in North Royalton, Ohio and serves Cuyahoga and Medina Counties. We are between Ridge Rd (Rt. 3) and State Rd (Rt.94) in front of Municipal Cemetery. Parking is available at the church. Additional parking for Sunday services and weekday evening events is available at Key Bank, just west of the church. We ask that visitors be careful not to block the ATM lane when parking at Key Bank. 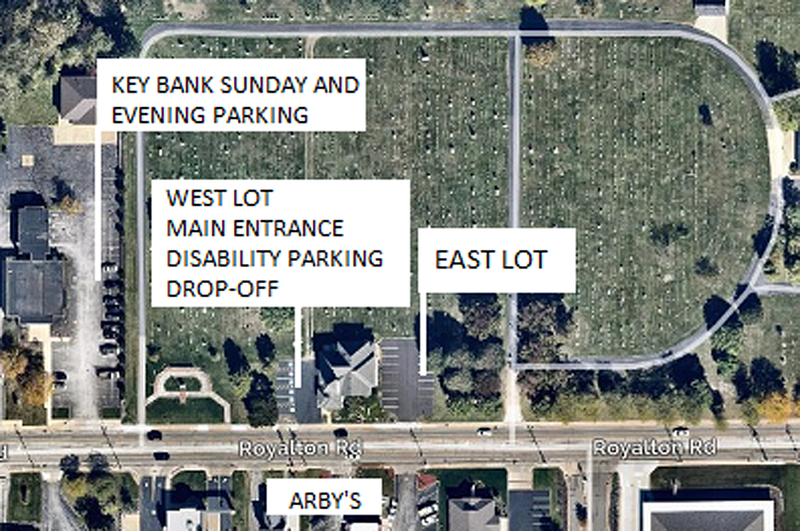 Disability parking spaces are in the west lot at the main entrance on Royalton Rd. The building has an elevator and an accessible restroom (gender neutral) next to the sanctuary. Our sanctuary contains comfortable upholstered chairs, including some with armrests, and room for wheelchairs. We have a t-coil hearing loop system in our sanctuary. Visitors can switch their hearing aids to the t-coil setting to pick up the signal. For visitors who don’t wear hearing aids but have difficulty hearing, we have two assistive listening devices with headphones. Please let our greeters know what accommodations you need, and they will help with the arrangements. Ushers will help you with seating for the t-coil loop system. We hope this makes our Sunday worship services more meaningful for everyone. Wear whatever you feel comfortable wearing: from business casual to jeans or shorts and sneakers. Children may have art projects or outdoor activities. They should dress so they can actively engage in the program. Childcare for infants and toddlers is available to parents during services. Religious Education is offered during worship services. Children stay with the adults for the first 15 minutes for a gathering song and a story. Then, they go to classes for the remainder of the hour. A few services each year are “intergenerational,” meaning that children remain with the adults throughout the service. If your child doesn’t separate well, she or he may stay with you in the service; or you may choose to attend class with your child.